At first the colonial settlement at Lenox was called Yokuntown, after a Native American chief, but the name was later changed to honor an English lord—Charles Lenox, Duke of Richmond—who was sympathetic to the American Revolutionary cause. Although small industries have at times appeared in the town, it has been predominantly rural and agricultural, and has remained unspoiled. In the 19th century business tycoons (including Andrew Carnegie) came to admire the tidy farms and streets of Lenox as the perfect place for a summer's retreat, and many of them bought up farms for this purpose. They transformed the simple farms into splendid estates complete with huge summer mansions. Many of the mansions are still standing for visitors to admire, and even stay in, as lots have been converted to beautiful—even palatial—inns and resort hotels. 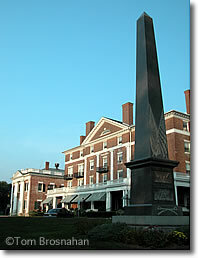 Civil War monument, The Curtis building and Lenox Public Library, Lenox MA.